I am in Ohio. Typically, I don't love it here. I've had a few doozy classes in the Buckeye State. Got a speeding ticket here, had someone hit my parked vehicle here. But I've had some good meals, a few fun times. And although the work part of this trip is beating me sideways, the non-work part isn't the worst. The Hampton where I am laying my curly, increasingly gray head is nice. Good location, quiet. And then there's Adam. Adam checked me in last night and we struck up a conversation. He clued me in on where to eat while I'm here. And he is just nice, personable and enthusiastic. I pegged him as about 23. He's 30. But he's good at his job, passionate about his town, and I like that. I'm also near a mall. A nice one with a Charming Charlie, a Macy's and a Lane Bryant. I had an ex-boyfriend who called it Lane Giant. While I shopped there. Note: ex. My car is fun this trip. 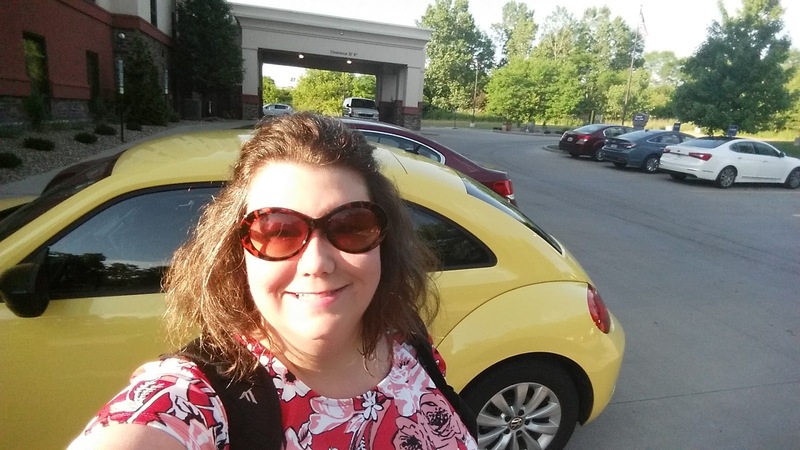 I got a yellow VW Beetle. It works. I'll be home in no time.